Heil® QuietComfort® DXT+ Two-Stage Heat Pumps featuring the Observer™ communicating system are designed to take your home to a new level of comfort and efficiency. Teamed with our Observer communicating wall control and a Heil communicating fan coil or gas furnace, the QuietComfort DXT+ functions as part of a complete communicating home comfort system. Various components of the system “talk” to each other electronically, fine-tuning comfort levels while maximizing energy savings. The QuietComfort DXT+ is built with premium components for quiet performance, including a two-stage scroll compressor with a deluxe sound blanket. A variable-speed fan motor operates primarily on quieter, lower speeds (HCH9 models only). Operating sound is further minimized by advanced aerodynamic fan and air discharge systems. This model typically runs at the lower stage, switching to higher operating levels as necessary. Custom-matched with a Heil variable-speed communicating fan coil or gas furnace, this two-stage operation delivers whisper-quiet operating sound levels and superior dehumidification. As part of a complete system, the QuietComfort DXT+ adjusts heating and cooling levels to match the needs of your home for a consistently comfortable flow of conditioned air. 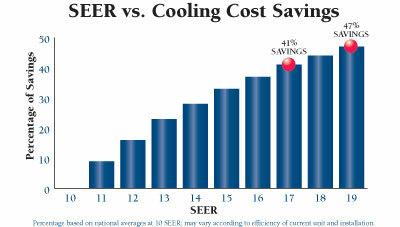 Energy savings up to 19 SEER/10 HSPF could save up to 47% when compared to an older 10 SEER unit. 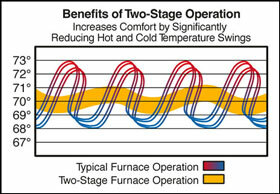 Two-stage operation system reduces temperature and humidity swings in the home by heating and cooling evenly. 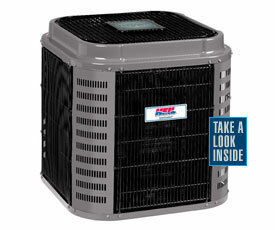 10 year No Hassle Replacement™ limited warranty* which gives the original purchaser a one-time replacement unit if the compressor or outdoor coil should fail within the first ten years. QuietComfort DXT+ Two-Stage Heat Pumps featuring the Observer communicating system function as part of a complete communicating home comfort system that includes the Observer communicating wall control (with full-color touchscreen technology), compatible indoor coil, and system accessories to create maximum efficiency and ideal comfort. Boost your energy savings with matching equipment, which can deliver efficiencies up to 19 SEER. Compare that to an old unit, which may have such poor efficiency that it’s costing you double to operate every month!